​Deidamia was a minor figure in Greek mythology made famous by the fact that she was at one point married to Achilles, and gave birth to a son for the Greek hero, Neoptolemus. Deidamia was born on the Aegean island of Scyros, for Deidamia was one of the seven daughters of King Lycomedes. Deidamia and her sisters would be joined in the royal court by a “female” guest, for it was to the court of King Lycomedes that Thetis brought her son Achilles, when she sought to hide him away. It was said that Thetis wished to prevent her son from fighting at Troy, for it had been prophesised that he would die if he did so. King Lycomedes was fooled by the disguised Achilles, believe that his new female quest was the sister of Achilles, but Deidamia was not fooled, and saw through Achilles feminine attire. Even though both Deidamia and Achilles were still young, the two would become lovers, and were eventually married in secret. Deidamia would subsequently give birth to a son of Achilles, a boy named Pyrrha, but a son more famously known as Neoptolemus. Achilles would eventually leave the court of King Lycomedes, for his presence was discovered by Odysseus and Diomedes, two Achaean heroes who were searching for Achilles, for Calchas had stated that Achilles must fight at Troy, in order that the Achaean would be victorious. Some tell of Deidamia trying to convince her husband not to leave, but to no avail. It was commonly said that whilst Achilles departed for Aulis, Deidamia and Neoptolemus remained on Scyros; although one version of the story of Deidamia has her following Achilles to Troy, disguised as an Achaean soldier. In this case, a reversal of roles for now Deidamia was disguised as a man, when previously Achilles had been disguised as a girl. Deidamia following Achilles though, does not fit in with the stories of Achilles at Troy. Deidamia would become a widow though, for just as had been foretold, Achilles led a short glorious life, dying upon the battlefield of Troy, killed by an arrow of Paris. Eventually, Odysseus would return to Scyros for now it was foretold that Neoptolemus would have to fight at Troy, just as his father had done. As with Achilles, it was said that Deidamia attempted to convince Neoptolemus not to fight, but again to no avail. It is more probable that at this point Deidamia also left Scyros, for Deidamia was in the company of her son shortly after the fall of Troy. 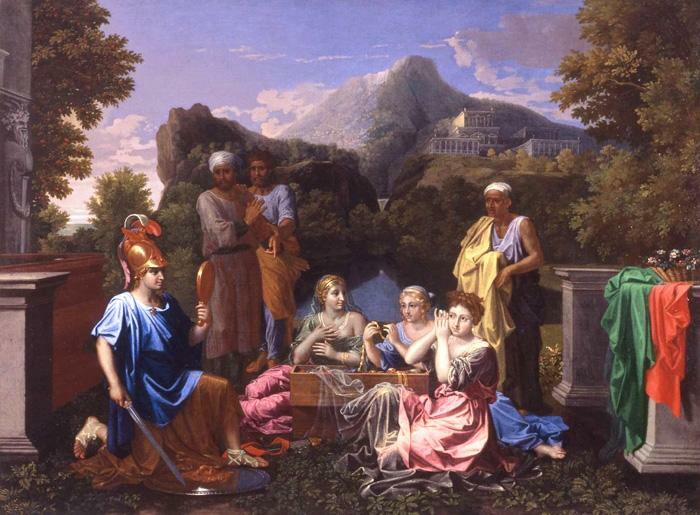 Neoptolemus, after the fall of Troy, travelled to Epirus to establish a new kingdom for himself, and in his retinue was Helenus, the Trojan seer, to whom Neoptolemus would wed his mother, Deidamia. Nothing more is said of Deidamia, and it is not certain whether Deidamia was still alive when Helenus married Andromache, the former wife of Hector, and concubine of Neoptolemus.